Vibrant Technologies focuses on Enterprise IT Hardware sales. Substitute Part Numbers. 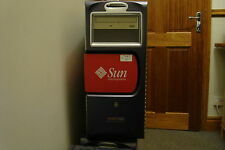 Sunblade 2500 Dual 1.6Ghz Ultrasparc IIIi Processors. - Sun PCi III PC Emulation card. This card contains an AMD Athlon single board computer with 1GB of RAM. This card has less than 50 hours of use on it.